Published in Rafu Shimpo, January 1, 1956, Japanese section. Part of a series on new faces, Shigeo Matsuhara, a master of the Japanese board game Go, plays with an older man at a gokaisho, Los Angeles Go Institute in California, December 18, 1955. 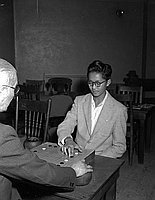 The central focus is on the boy who looks down at the game board and moves a circular black game piece with his proper right hand. He wears a light colored suit jacket over a white shirt, and dark rimmed eyeglasses. The older white-haired man is partially visible in the foreground, left, as he sits with his back to the viewer and his proper right hand resting on a bowl to hold game pieces. He, also, wears a suit jacket and eyeglasses. Empty tables and chairs in background. Typed on original negative envelope: Gokaisho.